Three big summer festivals to hold Russian-related events. Above, L-R: Hamid Ismailov, Natalia Osipova & Sergei Polunin; Daniil Trifonov. Classical musicians, an eclectic theater collective and a diverse group of authors crowd Scotland’s capital this August. Frequent visitors to the UK will perform in the music program of the Edinburgh International Festival. On the stage of Usher Hall, Valery Gergiev will conduct the Mariinsky Orchestra in their performance of Richard Wagner’s opera Das Rheingold. 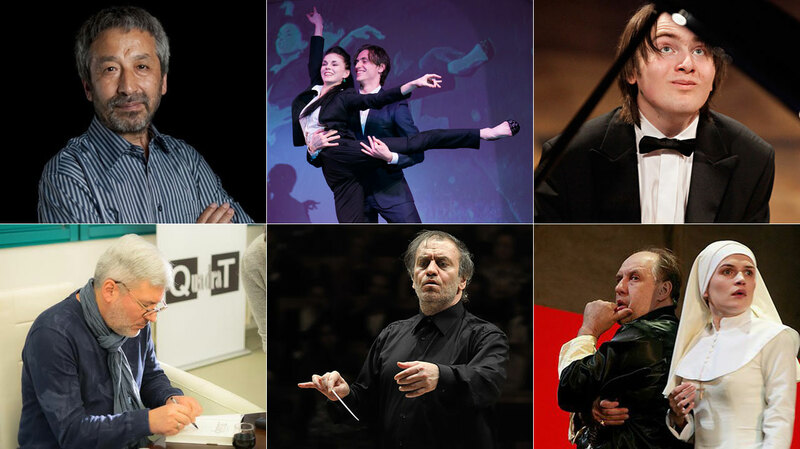 Violinist Maxim Vengerov and pianist Daniil Trifonov will also give recitals and the Russian National Orchestra will play Russian favorites Musorgsky and Tchaikovsky, as well as Mozart. On the 400th anniversary of Shakespeare’s death, the Pushkin Theater will present their interpretation of the bard's play Measure for Measure, staged by Declan Donnellan, to the Scottish public. The superstar ballet couple Natalia Osipova and Sergei Polunin will also be on hand to perform some special moves at the Festival Theater. The city’s Fringe Festival has prepared an even broader program for fans of Russian art and culture. The Derevo Physical Theater and Circus Company is back at the Fringe to perform a show called Once… "Once... is a fairytale dedicated to the eternal child living in us all," says the troupe’s website. The music program at the festival will feature the unusual Animotion show Peace and War- Russian artist Maria Rud will paint and be projected in real time accompanied by virtuoso flautist David Heath and DJ Dolphin. British musicians Hypnotique will play on the theremin, the world's first electronic instrument, which was created by Russian inventor Leon Theremin in the 1920s. The band trained on this instrument with Lydia Kavina, the inventor’s grandniece. The singers Ekaterina Gopenko and Magda Nova will present their show Reflections to the Edinburgh audience. For those that like comedy the International Incident show, featuring comedians from Russia, Romania, Ukraine and Malta, will be on hand. The Abi Roberts Company will perform Anglichanka (Englishwoman) and popular Russia comedians will perform stand-up. Russian writers are welcomed at international book fairs from Hong Kong to New York. This time around some meetings will surely be sharp, polemic and politically focused, but charming fiction is still on the agenda. Many of the events here are already sold out. British authors Luke Harding and Richard Shirreff will present their controversial new books about Russia. The Russian journalist Oleg Kashin and Ukrainian writer Andrei Kurkov will appear on the same stage to discuss politics. Translator Edwin Morgan will speak about Vladimir Mayakovsky and the poetic revolution he represented. Maria Stepnova, known for her Russian Booker Prize-shortlisted The Women of Lazarus, and Charlotte Hobson will discuss Russia at the time of the 1917 Russian Revolution. Vadim Levental will be on hand to present his newest translation into English, Masha Regina, at an event called “Novels That Inspire Novelists”. Eugene Vodolazkin, the author of the bestselling novel Laurus, which follows the life of a medieval holy fool and is translated into English (by Lisa Hayden), German and French, will discuss the influence of Umberto Eco in his works with screenwriter Neil Mackay. Hamid Ismailov, an Uzbek novelist who writes in Russian and lives in London, will discuss the end of the Soviet Union with novelist Guillermo Erades. Follow the links and you can vote for your favorite to receive a First Book Award, one of several special prizes of the book festival.